There can be several signs of a leak in your homes plumbing. Signs can range from drastic increases in your water bill, audible sounds of water running in your pipes when all the faucets are turned off, or visible signs of water on your walls, floors, or under the carpet. When you have reasons to suspect a leak in your plumbing, look no further than Flow Plumbing! For more than 25 years, Flow Plumbing has been the top choice for leak detection in Sunnyvale, TX and the surrounding communities, and we can help pinpoint the location of a leak and then make repairs. At Flow Plumbing, we are proud of our reputation as being known as the leak detection experts in Sunnyvale. TX. Over the years, we have investing in the best tools and training for our licensed plumbers in order to become the best at detecting even the hardest to find leaks. As a matter of fact, many of our competitors turn to us for assistance with leak detection! Between our own customers and helping other local plumbing companies, we handle a huge number of leak detections each year. When you suspect that your home may have fallen victim to a water or sewer line leak, the best thing to do is to act fast in order to minimize the damage. Give us a call at 214-388-8838, and we can schedule an appointment for one of our licensed plumbers to come to your home to perform a water leak detection test. Here at Flow Plumbing, we pride ourselves on providing fast and affordable service. In the majority of cases, our licensed plumbers can determine whether you have a leak in as little as 60 to 90 minutes. In the event that you do have a leak, we can accurately locate it within 3 feet of its location and then provide you with options for repair. If the leak is located in a sewer line, we can even inspect the line with a camera to give a complete visual on the cause and extent of the damage. Need Fast & Affordable Leak Detection in Sunnyvale? Sudden increase in monthly water bills. Your home’s water meter continues to run even after shutting off main water line. You can hear water running even when faucets are off and no appliances are in operation. Signs of water damage on walls, ceilings, or floors. Unexplained pools of water on the floor or carpeting. Your home begins to smell damp and musty. Visible mold or mildew growth. Don’t ignore any signs of a possible plumbing leak —the faster you give us a call, the sooner we can send out a licensed plumber to locate the leak and make repairs. Prompt leak detection and repair can prevent significant damage to your home and save you a lot of money in repairing water damage. Contact us today at 214-388-8838 if you are in need of Leak Detection in Sunnyvale Texas! A slab leak happens when one of the pipes located in your home’s foundation cracks or becomes corroded. Slab leaks are notoriously difficult to locate without specialized equipment and a well trained operator. Luckily, at Flow Plumbing we have the tools and expertise to quickly detect slab leaks with amazing precision and accuracy. 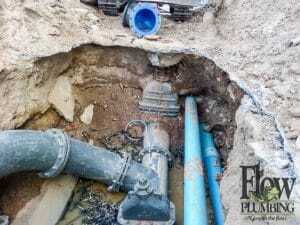 When you hire Flow Plumbing for slab leak detection in Sunnyvale, TX, one of our licensed plumbers will perform a leak test, determine if you have a leak, and then use our state of the art tools to pin point exactly where the leak is located. Don’t let a slab leak continue to damage the foundation of your home—call Flow Plumbing at 214-388-8838 today! After we detect a slab leak and pin point its location, the next step is to repair it. At Flow Plumbing, we offer very affordable and upfront pricing and we can begin to repair the slab leak as soon as it is detected. Our slab leak detection and repair services are second to none and we look forward to assisting you with this type of plumbing emergency.